“You see, Beloved Ones, you have to move away from the old paradigm of thinking and creating. You are living in a modern world but what has happened is that humanity’s consciousness has chosen to come through you re-creating all the old ways of being, re-hashing all the old systems. ONE MUST GROW WITH THE FLOW. The flow is moving to a new system of co-creation, therefore, you automatically must move with that flow into more Bliss (Bless)-full spiritual life. In previous Papers has been stated: ‘The “body” of God’s Universe Supreme is in it-Self a giant macro-holographic vortex of purposeful energy of unified intelligent Self stemming from the Paradise center. The Universe and all of its Creations and Evolutions of time and space are therefore of the Intelligent Design and so are you as the solar micro-holographic vortex of actualizing Supreme’s time-space potentials. Therefore to ascend the human-self must spiritually uplift (In-Light-developed, Enlighted) its individual and collective PUMA vortex physical vehicle (body) by its energies interferences with the higher universe mind spirits in order to sympathetically attract and move up along the universe dimensionally higher or “new” energies. Male and Female vortex PUMA-selves, evolved from the Male and Female central ego-centric vortex PUMAs, have their DOMINANT energy charges and polarities as illustrated below in Pictures 1 and 2. Male and Female vortex energy DOMINANT and RECESSIVE CHARGES and POLARITIES are presented in Picture 3 below. With the formation of the Physical UltiMate Atomic (PUMA) vortices, their indwelling forces bring many of the spin combinations of ultimate atoms into play mainly through their forces of attraction or repulsion within surrounding undifferentiated space forming walls of separation of each combination of sub-group or aggregate formed. PUMA vortex E-M expansions and contractions represent the pulse and breathing of its wave-particle within its environment. 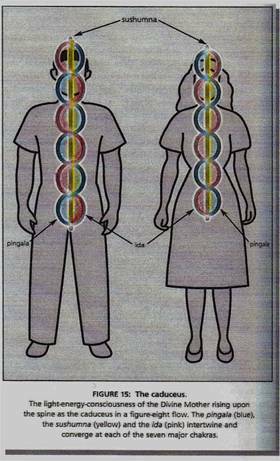 The PUMA vortex super-cell’s outer coil with its energy latitudes (parallels) and longitudes (meridians) flows represents the creature mater-realized “outer” energy body while the “inner” energy induction coil represents the vortex body matter-realized central or spinal energy column. The entire Supreme God's Grand Universe and down to its micro-cell aspects (down to the Physical UltiMate Atoms of the human body) are based on the holographic vortex principles and the interference phenomenas between the two different interfering vortex realms. Interference between the two different interfering energy realms precipitate in-between-the-two an induction plane of interfering energy awarenes or consciousness also known in the living systems as the MIND (electro-Magnetic INDuction). By reviewing the PUMA graphics you can imagine the Physical UltiMate Atom with its primary, secondary, tertiary spirals as the multi-dimensional interference multi-mind-planes holographic wave-particle vortex. Since the human embryo evolves from the central PUMA, and the human physical Male and Female bodies and the mother Earth are made from PUMAs, they all manifest the same holographic vortex wave-particle properties. We begun to examine this relationship between the planetary and human central PUMAs energy relationships further, focusing here on the planetary central PUMA vortex interference equatorial plane and then compare it afterwards to the human central interference “cosmic clock” plane. The human vortex and the planetary vortex and their evolving planes of interfering minds, in order to transcend from their lower interfering mind-matter realm into the higher, the evolving human and planetary ANU-mal (PUMA-mal) mind must succesfuly complete all of its ANU-mal lower-self mind requirements before advancing into the higher dimension. These are the principles of evolution from the lower ANU-mal basic 5-vortex/chakra mind into the HUMAN (Higher Universe MANifestation) basic 7-vortex/chakra ANU-mal mind by awakening and transiting gradually from the 1st basic (“root”) vortex/chakra interference mind upward to the 7th (crown) vortex/chakra mind by the Seven Adjutant Mind Spirits-matter/nature interferences.